ENSENADA, Baja California, Mexico —Spotlighting an in-depth preview of next week’s Golden Jubilee of the BFGoodrich Tires SCORE Baja 500 in Ensenada, Baja California, Mexico, Vol. 4, No. 5 of the acclaimed SCORE Journal digital magazine is now online. This issue also includes several special feature stories saluting the road to the 50th BFGoodrich Tires SCORE Baja 500 as well as SCORE News remembering two very special friends of desert racing. Vol. 4, No. 5 of the SCORE Journal is once again filled with numerous interesting worth-reading features, stories, exciting videos and several news items. This edition is centered around an extensive preview of the 50th BFGoodrich Tires SCORE Baja 500 with a look at the rugged race-record 542.12-mile course. 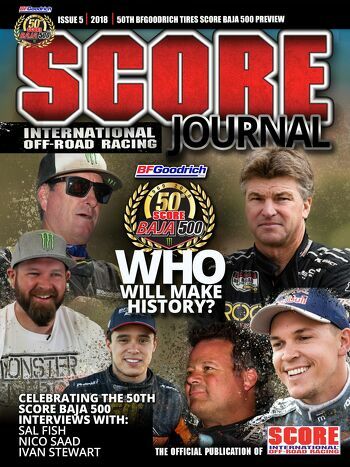 As racers and fans prepare for this historic race, this issue also remembers the start of SCORE Baja racing on July 26, 1974 at the Baja Internacional, the name SCORE had to use until 1991 when it finally got the legal rights to the name every always used—the Baja 500. Also in this issue is a colorful SCORE Baja 500 historical timeline saluting the events, people and vehicles that made the SCORE Baja 500 reach legendary status. In the SCORE News section is info on the special added contingency bonuses being offer by BFGoodrich Tires ($25,000), King Shocks ($5,000), Rancho Drivetrain Engineering ($20,000 transmission) and Tri-Ace Tires ($25,000) at the Golden Anniversary race. In the expanded 50 years of Glory celebrating the 50th anniversary of the SCORE Baja 500, are special pieces with co-Grand Marshals Sal Fish and Ivan Stewart along with industry pioneer Nico Saad and the three generations of McMillin family racers. Specifically, the Fish story recounts the times that the legendary SCORE Baja 5000 almost didn’t happen and Stewart reflects on his 10 overall 4-wheel vehicle wins in this race-a record that may never be broken. An up close look at Saad, the Off-Road Motorsports Hall of Famer who is an Ensenada tourism advocate and owner of the iconic San Nicolas Hotel, which is also celebrating its 50th year in 2018. In a look at the McMillin family a true Dynasty in the Desert emerges. It starts with family patriarch the late Corky McMillin and travels to his two sons Scott and Mark and their racing protégés Andy, Jessica, Daniel and Luke. Icing on the McMillin cake is a pictorial essay of ‘Macadu’, Mark’s McMillin’s amazing Chenowth open-wheel desert race car. The Off-Road Marketplace in this issue continues to shine brightly on the latest off-road products for 2018 for racers and enthusiasts. Featured this month is the 2018 SCORE Off-Road Wheel Guide for the serious enthusiast.